of their financial and human capital by sharing resources, data, and best practices. The San Diego Family Asset Building Coalition (SDFABC) is a partnership of nonprofit and community organizations united by the common goal of assisting low-income families achieve economic mobility. Drawn together by the belief that building wealth and assets is a critical step in advancing economic self-sufficiency among low-income families, we have joined together to strengthen asset-building programs across San Diego County and demonstrate the impact of asset building as an effective anti-poverty strategy. 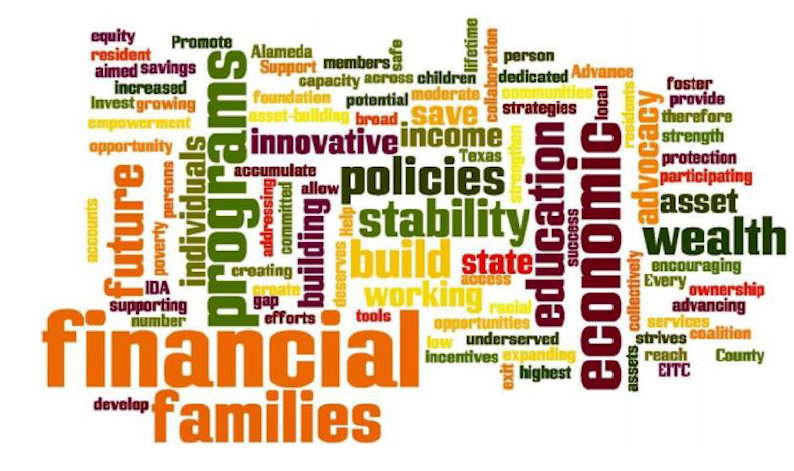 Each member of the coalition provides financial education and asset-building programming through an array of services including financial education and coaching, workforce development, homebuyer assistance, credit counseling, tax preparation and assistance obtaining public benefits. Share best practices and innovative strategies in financial education and asset building. Assess client needs and refer to services that best are most appropriate. Develop resources to support new programs, unique training opportunities, and regional and national partnerships. Work together to leverage programs to be maximally responsive to the changing needs of a very diverse community. Facilitate peer learning and communicate consistently with coalition members. Maximize use of limited resources by bundling services and eliminating duplication in services. Collect and maintain an inter-agency data set that tracks the usage, effectiveness and impact of asset-building programs across the county. Engage members to participate in local, state, and federal advocacy. The mission of Dreams for Change remains its guiding beacon: To respond to the needs of San Diegans by creating innovative and cost-effective programs to empower and stabilize the lives of underserved families and individuals. ​Community HousingWorks is a nonprofit that helps people and communities move up in the world through opportunities to rent and to achieve. Community Resource Center (CRC) is a nonprofit organization, established in 1979, that works to end hunger, homelessness and domestic violence in North County San Diego. All of CRC’s programs are designed to assist participants to successfully navigate their paths of safety, stability & self-sufficiency. ​Maximizing self-sufficiency with families and individuals through high-quality programs and advocacy in communities. Established in 1979, the San Diego Housing Commission (SDHC) is an award-winning public agency dedicated to preserving and increasing affordable housing within the City of San Diego. Home Start promotes the safety and nurturance of children by fostering healthy families and communities.